Wow, what a sky!, that doesn't look good, just before the rain came I suppose. You mostly get this strange bright light than. Love those sunshine bathed subjects against a grey sky. It become so more intense.Great shot Bill. Fantástico o reflexo no mar. You captured a beautiful light Bill. Hello, beautiful light right on the boat. Love the reflection, great capture! Happy Friday, enjoy your day and weekend! You live in a very interesting place and we are so lucky that you share these images with us. Thanks, and have a good week-end! In the spotlight. Great photo! Nice one. 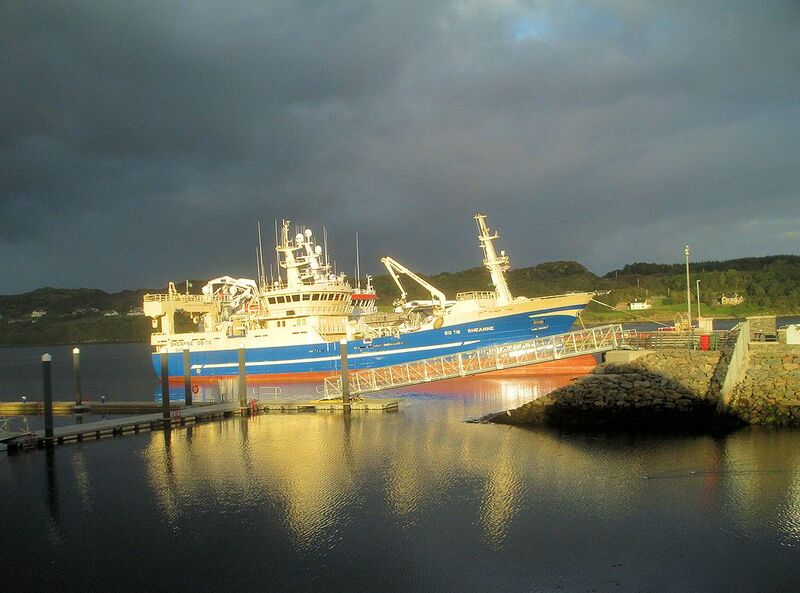 You were there at the right time to catch the blast of sunlight on the Killybegs. That’s a “duck for cover” sky! Great capture and nice reflection of the boat ! Awesome picture! Have a lovely weekend! Awesome shot. I bet you had to be quick on this one. OOOO you were in the right place at the right time for this one! Wow, what a light ! Wow, what a fantastic photo! That dark sky and that brilliant sunlight are a great combination. Looks about to blow up a hooley! What a beautiful photo Bill! The light is incredible. Wow - the light is fabulous in this shot. Wow - you were there at the perfect time, Bill! Wonderful! THAT is a fabulous photo! The sun and the dark skies....so good! What a fabulous photograph, how the light works in this picture is amazing. Beautiful capture. The boat really "pops"! Wow! You caught some perfect light here. Even the reflections are great. Nice job, Bill! Dark ominous sky. Looks like the boat is coming ashore! Lovely capture. this is absolutely awesome! well seen, great light!